Here's your daily news roundup, courtesy of our friends at TechRadar. With Google I/O happening this week, we've got news on a smartwatch from LG and a soundbar from JBL, as well as rumours of the next iPhone and a preview of the OnePlus 6 arriving this month. We're expecting some brand new iPhones to appear in September and the latest tidbit to spin out of the rumour mill suggests one of them will be a 6.5-inch device called the iPhone XI Plus. Supply chain sources say that 6.5-inch display is going to be crammed into a chassis the size of the iPhone 8 Plus – which means very little room for bezels. Two other iPhones are expected to launch at the same time, with 6.0-inch and 5.8-inch displays. Before the 2018 iPhones arrive, we're going to get the OnePlus 6 – the flagship is due to launch on 16 May, and the latest leaked image shows the phone in both white and black. The picture features actor Amitabh Bachchan, who posted and then deleted the image, and OnePlus CEO Pete Lau. As well as a choice of two colours, we're also expecting some high-end specs, a large 6.28-inch display, and a dual-lens camera on the phone's back. Good news! You'll soon be able to save your Nintendo Switch gaming exploits to the cloud. 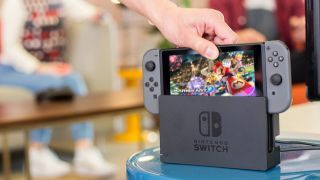 Not so good news: you're going to have to pay for the privilege of having a backup that won't die if your Switch does. The feature is launching in September of this year, Nintendo has announced, and will cost you $3.99 (about £3.10) for a single month, $7.99 (about £6.20) for three months together, and $19.99 (about £15.50) for a whole 12 months. This week Google is holding its annual Google I/O developer event, and we're expecting a lot of news around software and hardware from the tech giant. One of the announcements likely to be made is about a new Wear OS smartwatch from LG: apparently the wearable device is going to use its circular frame as a way of cycling through a carousel of apps, much like the Samsung Gear smartwatches. Before too long, we should know for sure. Finally, a new piece of hardware that is official. The JBL Link Bar combines a high-end soundbar, the Android TV platform, and Google Assistant, so you can plug it into your television set to browse through Netflix, get answers to burning questions, and enjoy better audio at the same time. As yet we don't have any pricing information for the device – like the LG watch, expect to hear more about this during Google I/O 2018 this week.